Peter Gene Hernandez, better known by his stage name Bruno Mars is an American singer, songwriter, record producer and choreographer born on 8th October 1985. Music is in his blood because he belongs to a musical family. That’s why Bruno was as well interested in music since his childhood. He began performing and making music at a young age. Before becoming a successful singer, Bruno gained recognition and success as music producer, writing songs for other artists including Adam Levine, Flo Rida and Brandy. As a solo artist, Mars made his first musical appearance in Far East Movement’s second album, Animal and was also featured on hip hop artist Jaeson Ma’s debut single, Love. 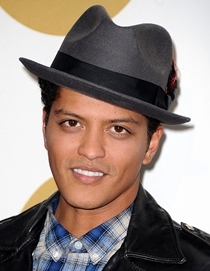 Bruno earned worldwide fame and success as a singer after being featured on and co-writing Travie McCoy’s “Billionaire and B.o.B’s “Nothin’ on You”, both singles peaked on the various charts worldwide. To continue his journey of success, Bruno released his debut studio album, Doo-Wops & Hooligans in 2010. The album received critical acclaim and spawned various hit singles including Just the Way You Are and Grenade. In 2012, he released his second successful album, Unorthodox Jukebox which as well produced numerous hit singles such as Treasure, Locked Out of Heaven and When I Was Your Man. Bruno has earned numerous accolades and nominations throughout his musical career including Grammy Awards, Brit Awards and MTV Europe Music Awards. In addition to that, Mars is a philanthropist and supports several charity organizations. In his personal life, Bruno Mars began dating model Jessica Caban in 2011. Following is the list of singer Bruno Mars body measurements including details of his height, weight, chest, waist, biceps and shoe size. Wearing a hat is his signature style. Mars can sing, dance and play various musical instruments. His father gave him the nickname “Bruno” due to his resemblance with wrestler Bruno Sammartino.